With the unusual British summer temperatures soaring above 30C, it seems strange to turn to a game which is about two teams of men racing through the frozen landscape to the South Pole. However, 1911 Amundsen vs Scott is a small box card game for two players and therefore is perfect for slipping into the holiday suitcase to make sure that the vacation is not completely game free! Inside the box are two sections of the game board which show the base game on one side and the expansion game: 1912 The Way Back on the reverse side. The two board sections are pushed together to form the tracks to the South Pole for the base game with Amundsen on one track and Scott on the other both joining at the South Pole. After deciding on which player will play each explorer, they take the relevant Player Aid card and coloured wooden meeple which is placed at the start of their track. The base deck of 55 cards is shuffled, one card dealt to each player and the remainder placed face down as the draw deck. The top 3 cards are turned over and placed in a row next to the deck. The game is now ready to start with the Amundsen player taking the first turn and then the turns alternate between the players. A player has can either Play Cards or Take Cards on their turn. Apart from a very few cards which only perform special actions, all the cards have a coloured top border (red, blue, green and yellow). The players advance along the tracks towards the South Pole by playing cards matching the colours of the spaces on the tracks (red, blue, green and yellow). The Amundsen track has no blue and the Scott track has no red spaces. The centre and lower portion of the card is taken up with a thematic graphic of the journey and any special action that may be possible. Cards showing dogs are wild and can be used as any colour for the Amundsen player whereas those showing horses work in the same way for the Scott player. Some cards show one of the two special action symbols: a Hand where the action is performed as the Play Cards action or a Cross where the action is performed when the card is discarded as part of the Take Cards action. Advance – by playing cards matching the colour of the space they are moving to: 1 card to advance to the next track space. To continue advancing 2 correctly coloured cards are required for each track space. With a hand limit of 7 cards it is possible to advance 4 spaces in one turn. To reach the final South Pole space 4 cards are required – one card of each colour. Of course wild cards can be used to substitute colours during the move. Compass – This card must be played in front of the player before reaching the South Pole. If it is played before reaching the 85 degree parallel then that player moves one space forward otherwise the player moves one space backward along the track. Equipment Loss – This card is played in front of the opposing player and limits their hand size to 5 cards instead of 7. Blizzard or Crevasse – If a player plays 2 of the same type of these cards then the opposing player loses their route. This means that the meeple of that affected player is moved off the track and to the “?” space behind their current position. 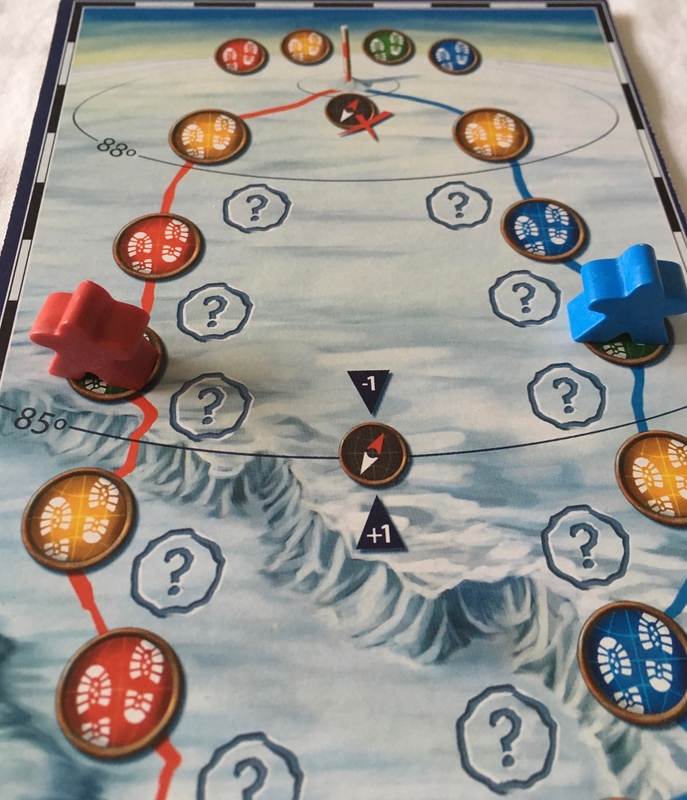 If on a later turn a single Blizzard or Crevasse card is played against a player who has lost their route then that player is moved back to the previous “?” space on the track. A player who has lost their route can perform all the normal actions with the following exceptions: they cannot play the Compass Special Action card and they can only play a single card to advance by moving back on to the track on the space behind their current position which matches the colour of the card played. Or: discard 3 cards and take all the cards in the row. Drop of Supplies – where the active player draws a random card from the opponents hand and adds it to their own hand. Sacrifice – The opponent shows his hand of cards and discards all “Good Weather” cards and all “Dog” cards if playing Amundsen or all “Horse” cards if playing Scott. Good Weather – The active player draws the top card from the draw deck face down. If the colour of the card matches the next space on the track they reveal the card and advance to that space. Regardless of the colour, the card is added to the active players hand. The Special Action cards without a colour at the top cannot be discarded. After taking cards the remaining cards in the row (if any) are moved away from the draw deck and replaced by new cards from the draw deck. The hand limit is 7 cards and must not be exceeded at any time during the game. The player who reaches the South Pole first wins the game and just like the real adventures of Amundsen and Scott there are no ties in this game – but at least no-one dies! However if the draw deck runs out for a second time then both players lose if a player cannot perform the Take Cards action. The rules include some variants to the base game. I find that the variants (instant elimination if a player has lost their route and gets a Blizzard or Crevasse card played on them; and a row of 6 cards instead of 3 to select from) add little to the game and I have not bothered with them after trying them out a couple of times. Expansion 1 is The Patrons, where each player gets a random Patron card during set up. These cards have effects such as starting with 3 or 4 cards in your hand; an additional wild card etc. This expansion gives a little more push to the initial game and makes the game slightly quicker. I tend to play half of my games with this added in, just to add a bit of variety. 1912 The Way Back – where the game is extended by playing the route home after reaching the South Pole. Damned Weather – where Weather cards are played when various parallels on the tracks are crossed. These cards act as events usually having a negative effect on the player(s). Food Depots – where each player gets a bonus on reaching one of their 2 food depots along the track. Whilst I have tried these expansions, I much prefer the base game as it is cleaner and plays quickly. For a card driven race game, I think that Perepau Llistosella has designed an intriguing way to spend half an hour or so. It comes in a small box and so it is one of my games of choice for holidays. What at first appears a simple card game soon deepens enough to keep even a hardened gamer interested and the interactions between the cards make for some tactical decisions. When you are lost do you go back multiple spaces just to get back on the path to avoid being knocked back further by more Blizzard or Crevasse cards? The cards are nicely illustrated by Pedro Soto and the iconography is clear and easy to learn. 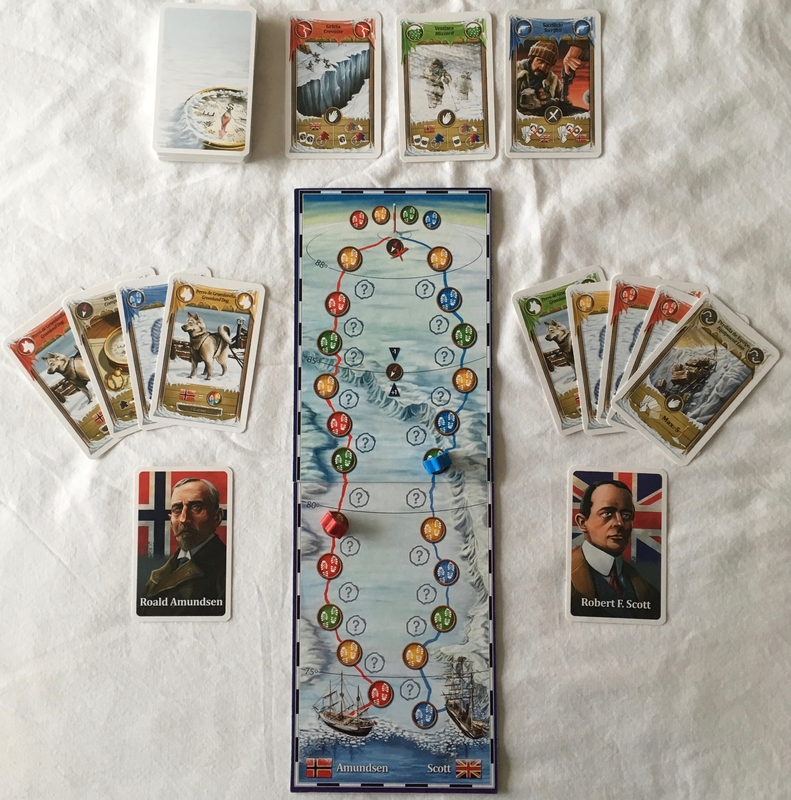 Being a two player game it rarely gets played by my gaming group, however it is popular at home with my family as it is simple to explain and the race element makes the route to victory obvious. 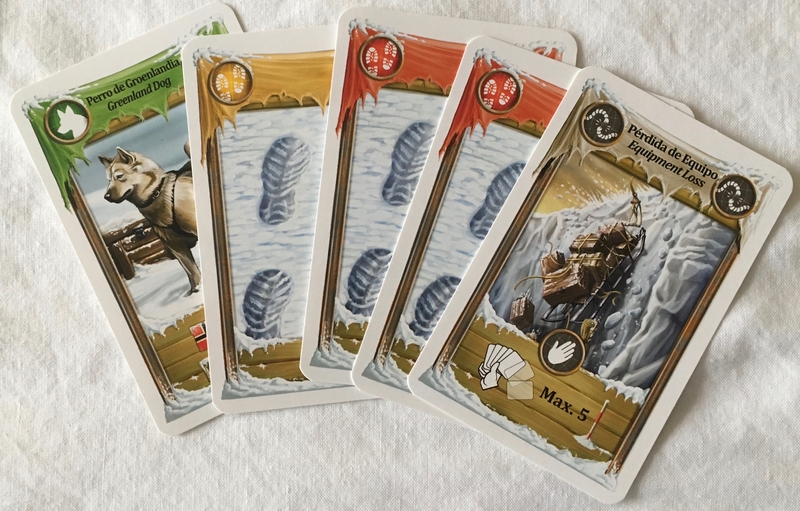 It is to Perepau Llistosella’s credit that he has embedded the theme of the original race to the South Pole reasonably well, something very rare in filler length games. Amundsen with his dogs pulling him southwards and Scott with his team of horses (which ultimately added to his downfall) are brought through in the card play. So if you fancy re-creating the great race of 1911 then look no further than 1911 Amundsen vs Scott. Joe Huber (1 play) – My attention was drawn to this game by Mark Johnson’s Spiel preview back in 2013; I have more two player games than I need, but I did try the game, and found it – acceptable. Nice theme, but the mechanisms didn’t really promote the theme as well as they could have. Hadn’t really thought much about the game for nearly five years; I’d consider playing it again if someone suggested it, but that’s never happened so far. I like it. 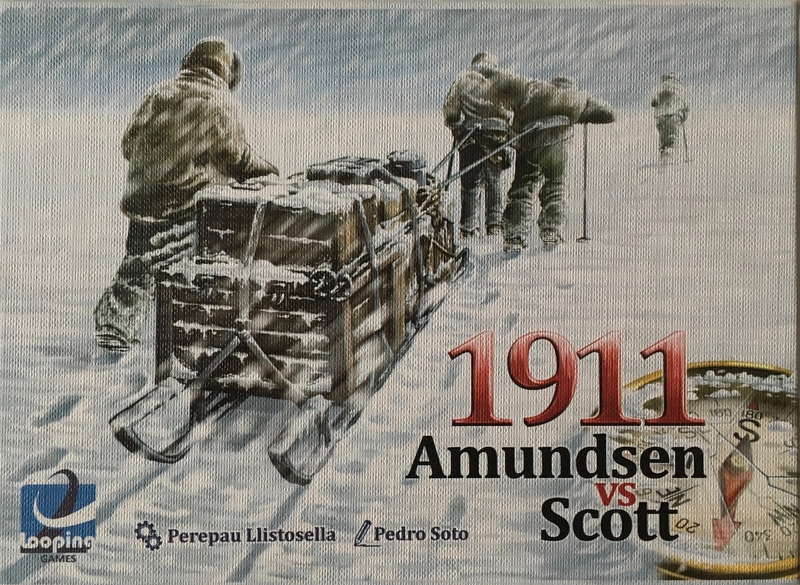 Simon N.
This entry was posted in Reviews and tagged 1911 Amundsen vs Scott, 2 player, card game, Filler, Looping Games, Perepau Llistosella. Bookmark the permalink.